Dr. Mitch Zientz grew up in Port St Lucie, on the Treasure Coast of south Florida. He and his beautiful wife Anastasia have a baby boy named Milo. You can catch him jogging or riding his bike along the Brooklyn waterfront, playing basketball at the Brooklyn bridge park, and often at a Mets or Nets game. There is a good chance the tunes you enjoy in the office are the result of a carefully curated mix or hand picked playlist by Dr. Zientz. Dr. Zientz attended Oral Roberts University in Tulsa, OK where he earned a B.S. in Biology with honors. He then went on to receive his Doctorate in Dental Medicine at the University of Florida. He completed a General Practice Residency at the prestigious Kings County Hospital Center in Brooklyn immediately following dental school. In residency, Dr. Zientz gained advanced experience in dentistry including dental implants, comprehensive multidisciplinary dental care, and emergency care. He is a member of the American Dental Association, New York State Dental Association, and locally with the Second District Dental Society. He also takes pride in staying current with all things dentistry and takes many continuing education courses each year to keep on the cutting edge of advancements within the field. He is a member of the esteemed Southeastern Prosthodontic Study Club. pursuing a career in dentistry. Dr. Claassen graduated from the University of Florida College of Dentistry and completed his residency in Bangor, Maine - spending much of his time serving the less privileged of the community. Committed to continuing education and learning new dental techniques and technologies, Dr. Claassen has completed training in dental implants at the University of Miami. He furthers his training at the Dawson Academy for advanced dental education and holds memberships with the ADA, NYSDA, and SDDS. On the weekends, Dr. Claassen likes to spend his time outdoors playing sports, exploring the city or visiting his hops farm. Dr. Claassen enjoys playing his cello as well. Alanna is a painter currently residing in Brooklyn. Originally from Ormand Beach, Florida, Alanna moved to NYC six years ago and quickly discovered a passion for dentistry. She is an artist who pays close attention to detail and is focused on providing superior service for all patients. When Alanna isn’t at the office she’s either at home painting, visiting museums, going to shows, or cooking. She’s always up for a friendly conversation about music, art, food, or cracking jokes. I was born and raised in the Brooklyn area. I have a bachelor's degree in Psychology from Hunter college. I have been an active part of the dental field for over 10 years. I began as a dental assistant and then receptionist where I quickly became passionate about dentistry. My passion inspired me to further my education at New York City College of Technology where I completed my studies as a hygienist. My goal it to make patients feel at ease by building confidence, trust and friendship with each individual. I am devoted to have every patient love their smile. In my spare time, I enjoy watching movies, listening and dancing to music, and photography. My goal is to help patients achieve and maintain optimal oral health. I grew up in California and am a dog and coffee lover. I graduated from NYU with a B.S. degree in Dental Hygiene. 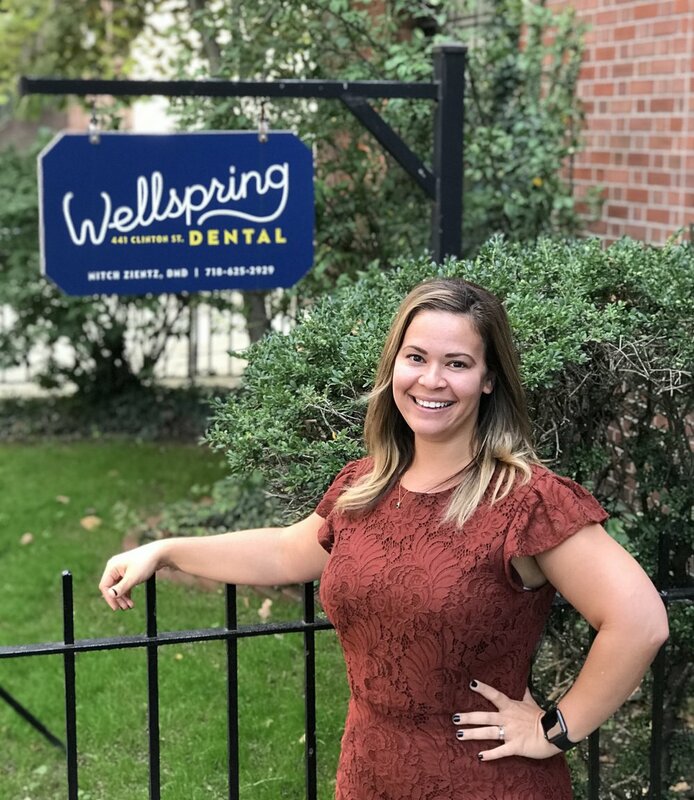 Originally from Indiana, she has a natural Midwest charm that helps alleviate her patient’s dental fears and ensures that they enjoy their visit. Brittany’s aim is to provide a thorough cleaning while also tailoring each patient’s experience to their specific dental needs. She believes that if you make dental hygiene care simple, yet effective, more people would develop better habits. During her downtime Brittany enjoys bike rides with her husband, taking their dog to the park, and getting cozy while reading a nice book by the fire… and in NYC that means setting the TV to the yule log channel. I assist with all dental procedures and am here to make your visit as comfortable as possible. I am a Brooklyn native, enjoy going on long walks and spending time with friends and family. Hey everyone, I'm Shani! I grew up in St. Cloud, Florida. I like cooking and I love nature and animals. I like being a dental assistant because at the end of the day it makes me happy to make someone's life brighter just by helping fix their smile. Born and raised in Brooklyn, Xena spends her free time fitness training and taking care of her loving puppies. 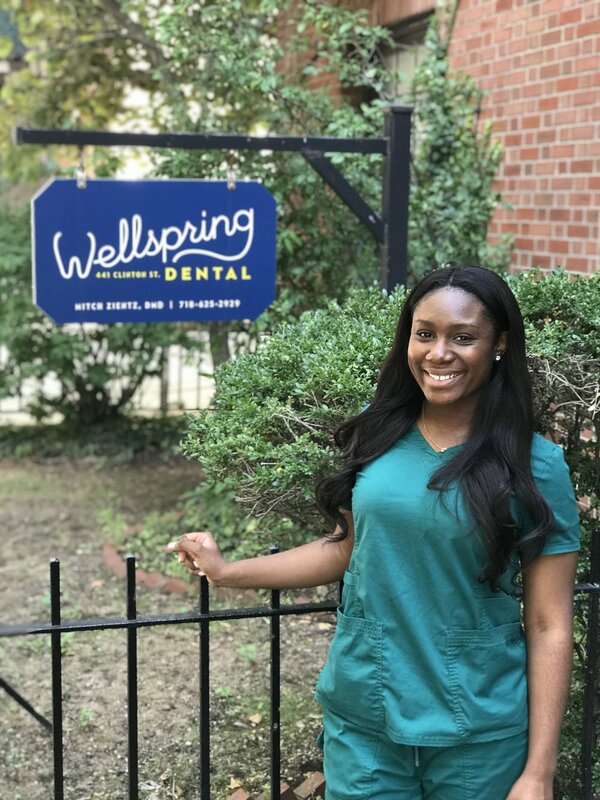 Xena joined Wellspring Dental in 2018. She promises a warm and inviting environment so that each patient feels right at home.